In your business, you're the hustler. You don't just accept what's in front of you. You challenge it. And you relish the opportunity to do so. 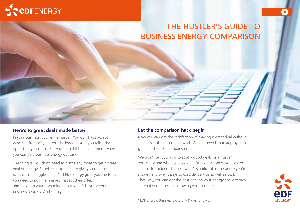 So why should it be any different when you compare business energy quotes? The thing is, you don't need to hustle any more to get a great deal on energy. Suppliers automatically give you their best rates online, haggle- free. And EDF Energy give you the tools you need to pull them apart, inspect their offer, and make up your own mind about what's best for your business. Compile and compare the best deal for your business with your Quick Quote Kit.